Nakayama Miho no Tokimeki High School (アイドルホットライン 中山美穂のトキメキハイスクール, Nakayama Miho no Tokimeki High School? lit. Idol Hotline: Miho Nakayama of Tokimeki High School) is a game developed by Nintendo for the Famicom Disk System and published in late 1987. It was the first dating sim of its kind, and the first bishōjo game featuring a Japanese idol. Miho Nakayama, a popular actress and singer in Japan during the 1980s, is featured on the game's cover and makes a cameo appearance in the game itself. Most of the game uses the familiar walk-around graphic adventure system. You can choose from commands like Move and Take from a side window, and interact with objects on the main screen with a pointer. Conversations and the results of your actions are printed out on the bottom window. Though the game is a standard text command-style adventure game similar to the Famicom Tantei Club series, in important scenes, the player is required to select a facial expression in addition to a verbal response. It was the third game compatible with the Disk Fax network of the Disk System, and uses a blue floppy disk instead of the regular yellow disk. Though most compatible games used the Disk Fax network to upload high scores or time trials onto the official rankings system, Nakayama Miho no Tokimeki High School was the only game where players used the network to register that they had completed the game to receive prizes. 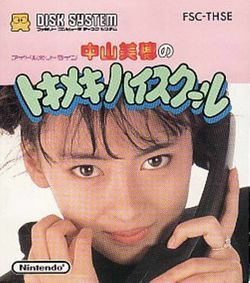 The game also contained a phone number which players could call to hear hints concerning the gameplay or listen to a personal message voiced by Miho Nakayama herself. This phone service ended shortly after the release of the game, and the messages and hints are displayed in text form in subsequent versions of the game. The game begins with your character, whose family has just moved to the area, entering his new school for the first time. After class, you accidentally run into a conservative-looking girl wearing glasses. She introduces herself as Mizuho, but you can't help but notice her striking resemblance to your dream pop idol, Miho Nakayama. You pick up a good-luck charm Mizuho dropped to give back to her, then make a startling revelation - your photographer brother took a picture of Miho carrying the exact same charm! You go to the music room to confront her with this evidence - and this is where the true challenge of the game begins. Miho Nakayama (中山 美穂, Nakayama Miho?) (born March 1, 1970) is an actress, model, and a former J-pop idol singer. She was born in Koganei, Tokyo, Japan, the older sister of another J-pop singer, Shinobu Nakayama. She made her J-pop debut on 21 June 1985. She also starred in this game, where she is a high school student trying to mask her true identity. Her fame in Japan is comparable, both in popularity and time-frame, to that of American actress Alyssa Milano. In 1995, director Shunji Iwai cast Miho in the starring dual roles of Hiroko Watanabe and Itsuki Fujii in the film Love Letter. The film was a huge box-office success and Miho won a number of awards including Best Actress at the 38th Blue Ribbon Awards, the 17th Yokohama Film Festival and the 18th Hochi Film Award. She was nominated for a Japanese Academy Award in 1998 for Tokyo biyori and has appeared in a number of TV series including Love Story (2001). This page was last edited on 14 March 2012, at 07:17.